Relieve skin irritation- Apply a drop of toothpaste to a bug bite or insect sting to stop the itching and decrease swelling. When applied to sores or blisters, it dries them up, allowing the wound to heal faster (best when used overnight). Decrease pimples & facial blemish- Apply a tiny dot of toothpaste on the blemish at night. Wash it off in the morning. Use non-whitening toothpaste on a forming pimple at night and you can notice it reduce the next morning. Clean up your fingernails- For cleaner, shinier, and stronger nails, scrub the underneath and tops of the fingernails with a toothbrush and toothpaste. Scrub away stinks- If you have onion, garlic or fish smells on your hands, rub them with toothpaste and then rinse in warm water. Remove stain- Apply toothpaste directly to the stain on clothes and rub briskly until the spot is gone, then wash. (Warning: Using whitening toothpaste on colors can sometimes bleach the fabric). Spruce up dirty shoes- This works great on sport shoes or scuffed-up leather shoes. 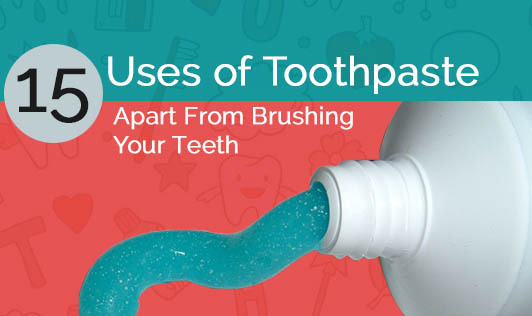 Apply toothpaste directly to the dirty or scuffed area, then scrub with a brush and wipe clean. Remove crayon stains on wall- Rub a damp cloth with toothpaste gently on the marked-up wall and watch the Crayon marks disappear. Make silver & diamond jewelry sparkle- Rub toothpaste onto silver jewelry and leave overnight. Wipe clean with a soft cloth in the morning. Make diamonds shine by gentle scrubbing using a toothbrush and toothpaste. Rinse thoroughly. Do not use this method on pearls. Remove scratches on DVDs/CDs- Apply a thin coating of toothpaste to the disc and rub gently, then rinse clean. It should work fairly well. Deodorize baby bottles- If baby bottles develop a sour-milk smell, a good cleaning with some toothpaste and a bottle scrubber will clean away residue and deodorize. Remove the burned crust on irons- The plate of the iron develops a burned crust after some time. The silica in toothpaste gently grinds away this rusty-looking layer. Clean Furniture- Gently rub the watermark with toothpaste using a soft cloth, and wipe it off with a damp cloth, let it dry and apply a furniture polish. Wall filler- If you have small pin and nail holes in your walls, you can use toothpaste as nice filler since it dries quickly. Poster adhesive- Just dab a little bit of toothpaste on the corners of the poster and in-between the edges. When you remove the poster, and if you have any toothpaste remnants on the wall, use a damp cloth to wipe it away. Goggles Defogger- To prevent fogged-up goggles, coat the goggles with toothpaste and wipe off. Avoid abrasive rubbing to avoid scratches. Who would have thought that a morning chore could be so useful in other ways!